BKC-100 AISI Type 304 stainless steel 16in. x 16in. (400mm x 400mm) x (specify) deep kitchen channel with 1in. 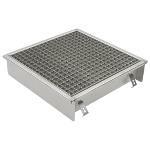 (25mm) thick mesh grating, and no hub bottom outlet.